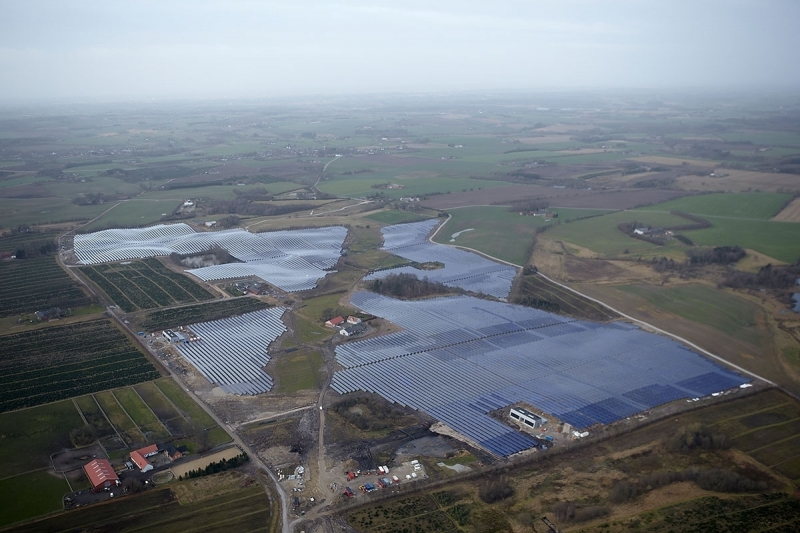 In Silkeborg, Denmark, the world’s largest solar thermal plant has been delivered at the end of 2016 as planned. With 156 694 m² this new record-breaking plant is more than twice the size of the largest until now in Vojens, also delivered by Arcon-Sunmark in 2014. In the past seven months, a truck has been loaded 445 times with solar collectors at the Arcon-Sunmark headquarters in Denmark in order to make the one and a half hour drive to the construction site. The 12 436 collectors are connected to the district heating system of the city.With an annual yield of 80 000 MWh the system will cover the heating requirement of 4 400 average households or 20% of the annual demand: ‘One fifth of Silkeborg’s annual heating consumption from now on will be covered by solar heating, and we are proud to be part of the project together with Silkeborg Forsyning. It is a proof of how swiftly a transition to renewable energy can be executed and that the process does not have to be long and time-consuming,’ says Søren Elisiussen, CEO, Arcon-Sunmark. The contract between Silkeborg Forsyning and Arcon-Sunmark was signed in February 2016. In May the construction began, and at the end of December the installation was put into operation.